NETWORK UPDATE: THE BIG BANG THEORY and THE BLACKLIST each gained 0.1 in final numbers. CABLE HIGHLIGHTS: Fox Business Channel’s REPUBLICAN PRESIDENTIAL DEBATE won the night, but at 1.85 it wasn’t quite as mighty as previous installments of the continuing soap. In fact, with 18-34s and Men 12-34, the debate lost to TNT’s Cleveland vs. San Antonio NBA BASKETBALL game, which had an overall 1.24 18-49 rating, putting it above the late Lakers vs. Golden State game at 1.07. Spike’s LIP SYNC BATTLE was down 0.33 from last week’s huge number, still strong at 1.04 (it was the biggest show of the night with the F12-34 demo). On USA, WWE was down 0.15 to 0.70, and the premiere of COLONY (which has been available online) was solid at 0.44. 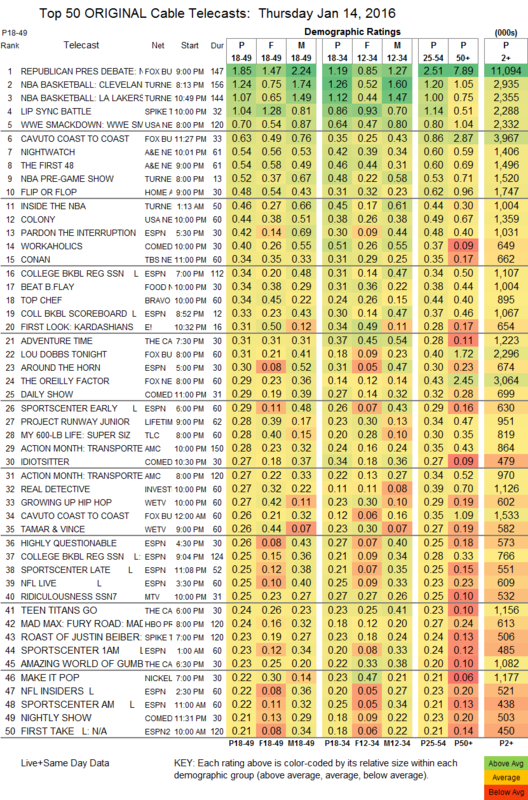 On A&E, FIRST 48 and NIGHTWATCH were each at 0.54, respectively down 0.08 and up 0.01 from last week. HGTV’s FLIP OR FLOP lost 0.12 to 0.48. On Comedy Central, WORKAHOLICS returned at 0.40, and IDIOTSITTER premiered at 0.27. Bravo’s TOP CHEF edged down 0.02 to 0.34. Food Network’s BEAT BOBBY FLAY held at 0.34. On Lifetime, PROJECT RUNWAY JR ticked down to 0.28, while CHILD GENIUS ticked up to 0.20. 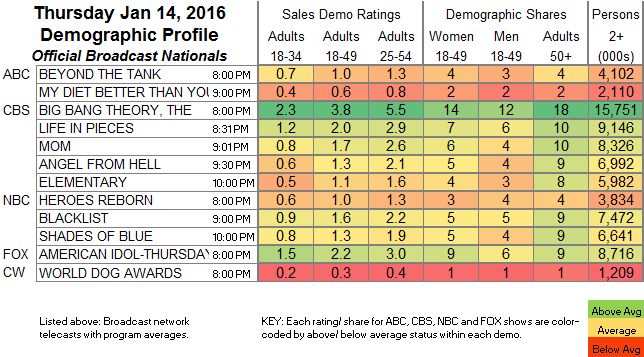 On We, GROWING UP HIP-HOP fell 0.16 to 0.27, and TAMAR & VINCE dropped 0.08 to 0.26. MTV’s RIDICULOUSNESS shed 0.14 to 0.25, GREATEST PARTY STORY EVER was at 0.13, and BROKE A$$ GAME SHOW was down 0.07 to 0.13. IFC again aired 3 episodes of TODD MARGARET to declining returns: 0.04/93K, 0.03/60K, 0.02/39K.